The -One Day Workshop of Mobilizing Religious Leader to Promote Women’s Leadership in Peace Building was successfully conducted on 18th Sep 2018. This one day workshop was arranged according to the plan to empower the participants (11 Imams’) competitive abilities and enhance their role to support prompting Women’s leadership in Peace Building. The workshop was held in NECDO Training hall and facilitated by Ms. Jamila Afghani President WILPF Afghanistan Section. The -One Day Workshop of Mobilizing Religious Leader to Promote Women’s Leadership in Peace Building was arranged according to the plan on 18th Sep 2018 for 11 Imams’ introduced by MORA in NECDO office. The workshop was started by the recitation of the Holy Quran by one of the participant. Then Mr. Kakar opened the program & welcomed the participants, then provided a brief speech about the goal and objectives of the workshop. Also he added that these 11 persons can make a strong network among themselves. Our aim for conducting such a program is to know about your expectations introduction to WILPF and understanding of the important of women role in peace as well as giving awareness on 1325 UNSCR. Then Ms. Afghani offered her presentation, an Introduction to Afghanistan WILPF Section and international WILPF she added that WILPF-Afghanistan group works for Afghanistan free of war and violence, where social justice and freedom for everyone is prevailed and women can play an active role for sustainable peace and development in the country. She added, “We aim to bring together women in Afghanistan as peacemakers and enhance their role in the development, freedom and prosperity in order to be able to become active and constructive member of the global movement for peace and freedom (WILPF)”. 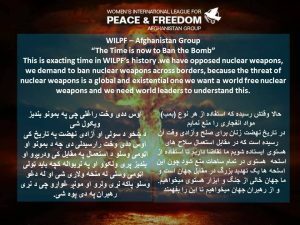 WILPF-Afghanistan is a group of volunteer network of women, youth and men who are strongly committed and believe in common that there is urgent need for permanent peace in the country. We highly consider the 3 points below as we step our longstanding ambition. Also she talked about Role and Regulations and expectations from workshop, she emphasized on Ulama to support women’s role in peace and security from their stage in the mosques and the platform from where they address the people youths and males. She talked about the Impact of Peace on the Development process Importance of women role in peace and security in Introduction the sustainable development goals and got the Ulama to understand and support the initiative. 1-One of the participant said, “This workshop was good and informative, the issues which was presented about peace was very useful we know that peace is really desire of every beating heart and Islam always recommended us to live in peace”. 2-One of the participant said, “The program was really good and we appreciate that women are working for peace building and they wants to change the idea of war to a peaceful life”. 3-One the participant of said, “In general the program was very good especially introducing of WILPF and Introduction of 1325 UNSCR was very important issue and every person should know about 1325 UNSCR and its value”.